A clever dad has become an internet sensation with his ingenious idea to create an interactive, and hilarious, Halloween costume for his daughter using LED lights in the shape of a stick figure. Known to the world as “Glowy Zoey,” the costume’s LED strip lighting glows in the dark and, when worn by a toddler, appears as if a miniature stick figure is running around, which is arguably the cutest spectacle we’ve ever seen. The LED strips shaped in the form of Minnie Mouse are powered by an Arduino micro-controller that is programmed to change color in response to his daughter’s voice. The lights change color when his daughter Zoey makes a loud noise or giggles, which he programmed to glow in twelve different modes with 372 LED lights. The Californian Dad, Royce Hutain, first originated the idea when he started making adult LED stickman suits for snowboarding. A lightbulb went off when he realized that the technology would be an incredibly comedic costume for his daughter’s first Halloween where she could finally walk. After posting a video of her comically running around in the costume on YouTube, it managed to garner 22 million views and quickly became a “glowing” sensation. This year, Hutain decided to elevate the plain stick figure by fashioning her costume into the shape of Minnie Mouse and taking a family trip to Disneyland. The results are completely and utterly adorable. In her latest YouTube video, Zoey is asked how much Halloween candy she will receive and she exclaims with an impossibly adorable answer of “Three!”, which Hutain now explains Zoey meant as “three pounds.” Zoey’s cute ensemble was such a big hit, that Husain now sells his LED stickmen costumes for kids and adults alike on his website GlowyZoey.com. The Minnie Mouse shaped version is not yet available, but we can only hope that it will be up for grabs next year. A clever Dad has become an internet sensation with his ingenious idea to create an interactive, and hilarious, Halloween costume for his daughter using LED lights in the shape of a stick figure. Known to the world as "Glowy Zoey", the costume's LED strip lighting glows in the dark and, when worn by a toddler, appears as if a miniature stick figure is running around, which is arguably the cutest spectacle we've ever seen. 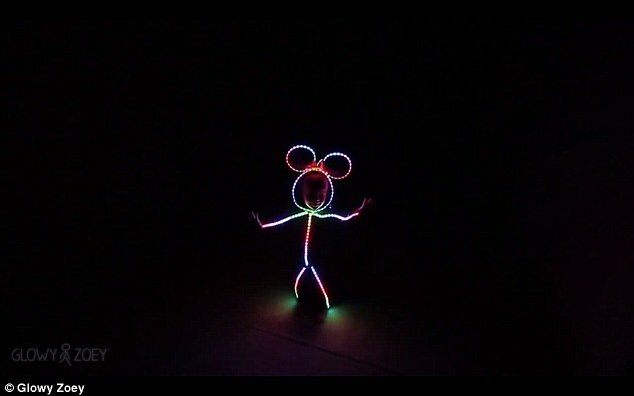 The LED strips shaped in the form of Minnie Mouse are powered by an Arduino micro-controller that is programmed to change color in response to his daughter's voice. The lights change color when his daughter Zoey makes a loud noise or giggles, which he programmed to glow in twelve different modes with 372 LED lights. 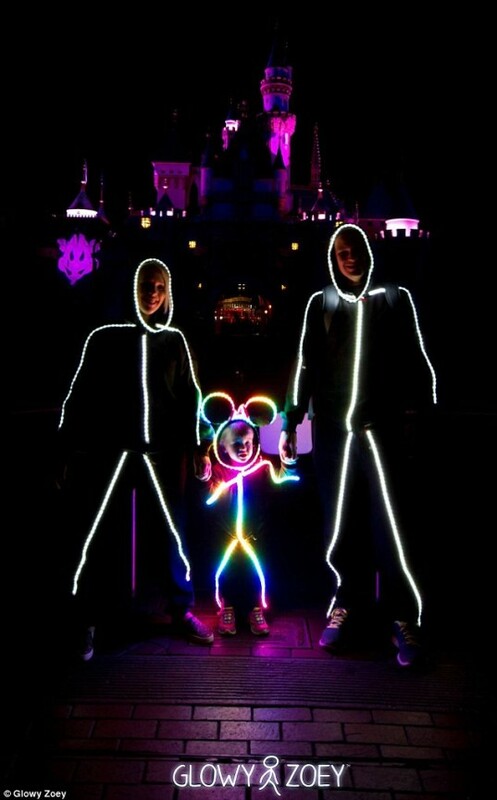 The Californian Dad, Royce Hutain, first originated the idea when he started making adult LED stickman suits for snowboarding. A lightbulb went off when he realized that the technology would be an incredibly comedic costume for his daughter's first Halloween where she could finally walk. After posting a video of her comically running around in the costume on YouTube, it managed to garner 22 million views and quickly became a "glowing" sensation. In her latest YouTube video, Zoey is asked how much Halloween candy she will receive and she exclaims with an impossibly adorable answer of "Three! ", which Hutain now explains was meant as "three pounds." This year, Hutain decided to elevate the plain stick figure by fashioning her costume into the shape Minnie Mouse and taking a family trip to Disneyland. The results are completely and utterly adorable.